Scott's Web Log: What Role Should Color Play in Insulin Packaging? What Role Should Color Play in Insulin Packaging? Earlier this week, Close Concerns commented on an Eli Lilly and Company press release that the company was launching a color differentiation system for their U-100 insulin products in the U.S. Unfortunately, the company seems to be conveniently overlooking something I wrote about back in April 2008, namely that the Institute for Safe Medication Practices (ISMP) reported a marked increase in reports about mixups between U-100 and U-500 insulin, and made some recommendations for pharmacies to help them avoid such mixups, including having the major suppliers of drug information systems to add the word "concentrated" on their computerized selection screens, immediately following the drug name and preceding "U-500". They even posted a video on YouTube to address the issue! 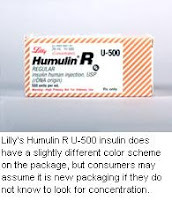 Certainly, color SHOULD have a place in preventing these types of mixups, yet Lilly's latest plan fails to even address U-500 insulin, even though they are the ONLY company selling this highly concentrated variety in the U.S. market. 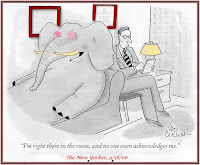 Hellooooo ... there's an elephant in the room, and no one is noticing it! Why not? Mixups can and do happen, and although Lilly deserves some credit for this move, consumers and pharmacists alike would probably benefit from more standardization across the industry, not just within a particular brand -- standardization that regulators at the FDA have really let manufacturers go it alone. The manufacturers want to customize color schemes for themselves, rather than adopting a uniform color scheme. They view it as a branding decision. For example, in Lilly's case, back when its rapid-acting insulin analogue was approved by the FDA in 1996, the company decided unilaterally to adopt a burgundy color scheme for the crimps, vial caps and pen cartridge inserts to designate that it was a different, more rapid-acting insulin analogue. But when rivals Novo Nordisk and (Sanofi) Aventis received FDA approvals for their rapid-acting analogues, neither company adopted Lilly's burgundy color scheme. This meant that patients could not rely on color to identify a rapid-acting insulin analogue unless it was from Lilly. Does this really make sense? Wouldn't it have been better if all rapid-acting insulin analogues had the same color scheme -- and burgundy was used on Humalog from Lilly, Novolog from Novo Nordisk and Apidra from Sanofi Aventis? On March 7, 2005, the U.S. Food and Drug Administration's (FDA) Center for Drug Evaluation and Research (CDER) did hold a hearing to obtain public comment about the practice of using color on pharmaceutical labeling and packaging in an effort to identify, classify or differentiate drug products. The transcript for that hearing can be seen at http://www.fda.gov/cder/meeting/part15_3_2005/Transcript.pdf, and the various presentations given at the meeting can be found at http://www.fda.gov/cder/meeting/part15_3_2005.htm. As usual, the meeting consisted mostly of representatives from the industry that the FDA is supposed to be regulating who sent various "experts" to testify on the subject. The FDA noted that there is (so far, anyway) little "scientific" evidence that applying color is effective in reducing medication errors and there is no validated scientific method to corroborate the usefulness of applying colors on pharmaceutical products packaging and labeling for that purpose. Of course, the lack of evidence is probably because no one has bothered to test the theory on using colors. 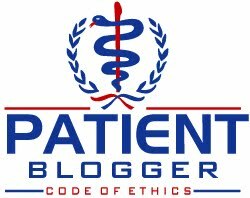 The practice of applying color is somewhat controversial even among patient safety groups; and the practice has both supporters and detractors. Danish insulin manufacturer Novo Nordisk A/S participated in the 2005 FDA hearing and gave a presentation on the company's experience in using color in packaging to help differentiate among product variations within a drug class (in their case, insulin). For the most part, Novo claimed that use of color was useful but stopped short of endorsing an FDA mandate for it (what manufacturer would ever advocate for MORE regulation? ), preferring that color be proposed by each manufacturer and subsequently approved by FDA, which is pretty much what happened. Novo's 2005 presentation to the FDA on the subject of using color in packaging can be viewed at http://www.fda.gov/ohrms/DOCKETS/dockets/05n0036/05n-0036-c000002-01-vol1.pdf. Novo's core claim was that they use color in branding their products, and that color can play a role in minimizing mixups. But color branding is meant to use color in order to distinguish one item from another, but they noted it is not intended for the color to be a substitution for reading the label. The company claimed that colors should be chosen by the manufacturer for their brand(s), rather than having a uniform adoption of color in packaging. Presently, there is no systematized standardized application of a color code that includes pre-assigned colors for use by the drug industry as is the case for color coding used by the American Dental Association for anesthetic concentrations. Currently, the FDA's Code for Federal Regulations (CFR) does not prohibit the use of color in insulin packaging, but it also does not specifically encourage its use. Indeed, there are no standards, so Lilly is free to do one thing, and Novo Nordisk can do something different. Naturally, there were some manufacturers who are opposed to FDA mandates on color, particularly contract manufacturers such as Hospira, Inc. (which, ironically enough, actually manufactures Humalog and Humulin insulin for Eli Lilly and Co., for more on that see my previous post on that topic). Hospira's position on this issue was understandable, arguing that the reliance on color discourages pharmacists and patients from actually reading the package labels, while also sensitizing them to looking for colors instead of the drug name(s) and/or other product details, which they argued is and always will be the primary identifier. Fair enough, but the goal of the FDA meeting was to determine whether color can play a role in improving patient safety. We know mixups happen at the pharmacy level, and also patients have mistakenly used the wrong insulin concentration (namely U-500) because they mistakenly assumed that all insulin is the same potency (U-100), and simply assumed that differences in packaging was, as Novo Nordisk claimed, a "branding decision". But the real reason for Hospira's opposition seemed to be the fact that the company, as a contract manufacturer for other companies, already deals with approximately 3,300 changes/year to comply with the FDA made via action letters, mandates, complaints, etc. But the arguments made in their FDA presentation were generally not convincing, deferring to the lack of evidence rather than making a legitimate case for or against the use of color. I realize these issues are not a substitute for adequate patient education, but the fact is that diabetes educators are increasingly in short supply, and many family doctors do all of the education but aren't exactly diabetes "experts" (they are, by practice, generalists) and may overlook something which seems so obvious (like insulin concentration), thinking it's a non-issue, when it could lead to a dangerous situation if a pharmacist were to mistakenly give the wrong product to a consumer. My own feeling is that the FDA should be mandating category-wide color standardization, but as Jenny Ruhl so eloquently writes "The lax FDA drug approval process combined with virtually no oversight of drug company marketing practices is also why the costs for treating diabetes have doubled in the last eight years." Do you think package color is a "branding decision" as Novo Nordisk argues, or should regulators at the FDA mandate what colors to use for various categories (such as "human" insulin, rapid-acting analogues, long-acting analogues)? Also, please be sure to answer my poll question on this subject on the right! I think it's a ridiculous assertion that it's a branding decision. When a company has a pill that comes in different strengths, they often make each strength a different color - Synthroid for example. If one normally takes the yellow pill, but finds the pharmacist gave them blue, they'll likely call the pharmacy. How is that not evidence that color-coding works? If it's applied across a class of medications, regardless of manufacturer, it's really just common sense that it would lead to fewer mix-ups. Yet another example of how infuriating the pharmaceutical companies are. Please! When are people in this country going to take personal responsibility for their medical treatment. People in other countries laugh at how irresponsible we are when it comes to our own personal health. It's so easy to blame the doctor, the pharmacy, the pharmaceutical company, but harder still to look in the mirror. Read a label, ask questions, it's your health! Ideally to prevent the terrible mixups that occur, you'd want to have more than a color difference. Perhaps a dramatic difference in the shape and feel of the pens or syringes used for basal and fast acting insulin. That's the mix up that does the most harm and which people report the most frequently. If you had a device for administering basal that ONLY worked with basal insulins and really stood out from the one that only worked with and dispensed fast acting insulin, you could discourage mixups. Kind of like the way they made the car gas tank opening too small for the old leaded gas nozzles years ago. This make it much less likely people would put the wrong gas in the car. I'm not sure that the color thing alone would help as much as it should because I hear from so many people who know the difference but still grab the wrong vial when they are rushed. Color should not be an issue related to insulin packaging or anything else which was addressed in great detail during the Civil Rights Act of the 1960's. One major fact the author left out is that U-500 comes in a 3mL vial rather than the standard 1mL vial... that's a pretty MAJOR distinction that even a blind patient could distinguish.